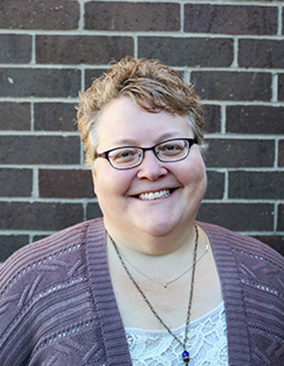 Judi started at Harry Meyering as a freshman in college with the intention of staying while she finished her Human Services Management degree. Her degree has long been finished but she still remains. Over Judi’s time with Harry Meyering she has worked in a many different positions and in all the programs and currently is the program director for the Supportive Living Services and Semi-Independent Living Services programs. Judi’s passion is her purpose and it drives all that she does at work and outside of work. She desires to teach and inspire people to discover and develop their inherent values and gifts in themselves and others. As a strong believer that all people have value and all people deserve to live a happy, healthy and successful life, Judi surrounds herself with people and activities that support and align with this thought process. The work Harry Meyering does to support individuals is in perfect alignment with Judi’s passion and purpose. She is also involved with Zonta; an international service organization focused on empowering women through service and advocacy. Judi is also on the board for the Miracle League of North Mankato, a sporting league for children and adults with intellectual and physical disabilities. Judi is married and has one daughter, a son-in-law and one adorable grandson. She also has two rescue dogs, GeiShe and Ruko, that are spoiled and are her “babies”. Judi’s family means the world to her as represented by her tattoo her family holds the key to her heart. As a family, they enjoy spending time together and watching reality TV and the Food Network. In her free time, Judi enjoys cooking, quilting, crafting and reading. She is currently working on writing a cookbook, which is somewhat ironic since she rarely follows a recipe when she cooks. Judi’s dad always said “Any job worth doing is a job worth doing right!” and to this day she lives by these words in all that she does.